Howdy! I just wanted to get a reminder out! 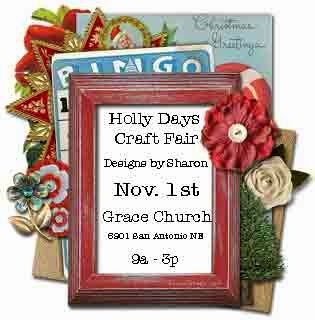 The first of the Arts & Crafts Fairs that I am participating in this holiday season is right around the corner. November 1st! At the Grace Church @ 6901 San Antonio NE, Albuquerque, New Mexico. I will have a variety of hand-made paper crafts for sale: greeting cards, altered note pads, altered notebooks, desk top calendars, holiday packaging (bags, and boxes) and much, much more. I hope to see you there! My virtual shop on Etsy will be closed the day before, the day of, and the day after the craft fair.